Our Huawei P9 lite review unit came with a regular 1A charger. The phone does not support quick charging, but a 2A charger or at least a 1.5A one would have been appreciated. Also in the box was a microUSB cable to go with the charger and an EarPod-like headset with a remote. The Huawei P9 lite has a 5.2" screen, same as the full-fat P9. However, it is physically a bit bigger - a couple of millimeters taller and wider, half a millimeter thicker. This doesn't hugely affect the handling. Our grip felt equally comfortable and the polycarbonate back offers some extra grip. The P9 Lite weighs 3g more, 147g in total (about the same as an iPhone 6s), but the phone actually feels light. Note that the phone is a little top heavy, but not enough to have a negative impact on handling. 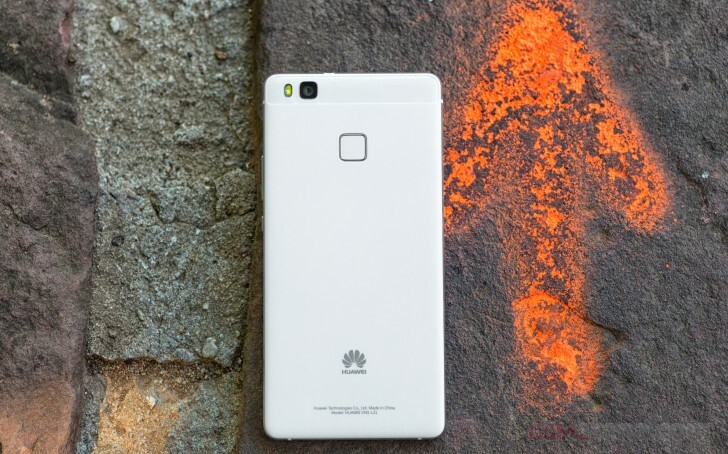 The Huawei P9 was the first time the series went with a full metal body, the P series before the P8 had a metal frame and a polycarbonate back, just like the P9 Lite does. So if you're looking to upgrade from an older generation, you'd feel right at home. We have the White P9 Lite, but the phone also comes in Black and Gold. Huawei has taken care to paint the exterior uniformly, including the front (which many makers skip). On the "big" P9, the White color option was a special Ceramic edition. No such thing here, all three color options use the same materials. This means glass on the front (with no word on scratch resistance, same as the P9), metal on the sides and satin-finish polycarbonate on the back. The P9 lite lives up to its premium mid-range status in both look and feel. The front has a small lip around the glass, which lifts the glass a fraction of a millimeter when the phone is face down. Because of it, the transition from the front to the sides isn't very smooth, but from then on the curves flow into each other. These rounded sides don't quite hide the extra thickness of the P9 Lite, but they do help the bezels appear thinner. This is a visual trick, the metal sides and the bezels within the glass add up. The P9 Lite isn't the narrowest phone with a 5.2" screen, it'd say it's about average. Besides the screen, the front houses the 8MP selfie camera, proximity and ambient light sensors and a notification LED (a tiny dot in the top right corner). The LED is invisible when off, but not the most noticeable even when it's on. There's nothing but the Huawei logo below the screen, Android buttons are on screen, the mouthpiece is at the bottom. It's behind the grille on the left, the right grille hides the loudspeaker. Normally, we give the loudspeaker only a passing mention (unless there's two of them), but this one is backed by a 9 V Smart Amp similar to what we had with the more premium Huawei P9 or the Huawei Mate S. Make sure to check the loudspeaker results to see if it paid off. On the top side of the Huawei P9 lite is the second mic for stereo sound recording and noise reduction. Also here is the 3.5mm headphone jack. The only hardware buttons are on the right - the Power button and the Volume rocker. They are comfortable enough to use and the Power button has a texture, which makes it easier to locate by touch. The card tray is on the left. It's a single tray for two cards - either two nanoSIMs or one SIM and one microSD (it takes the place of SIM2). The back of the P9 has a trademark dual camera look, but the P9 Lite has one camera and one flash. They are still placed on a separate plate from the rest of the back, a design element common in the P family. Below that is the fingerprint reader. It has a small lip around it to help in the precise positioning of your index finger.